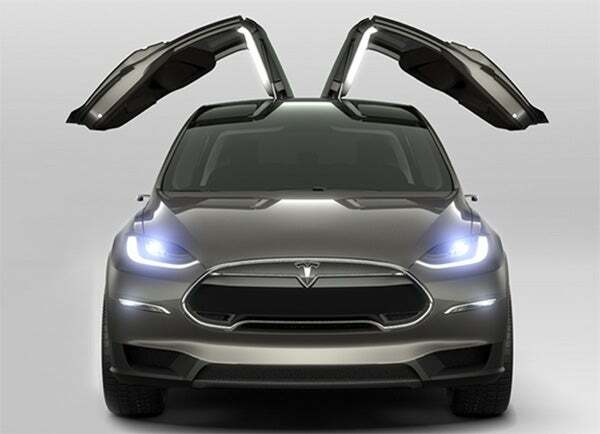 The wait for pricing and specs on Tesla’s long-anticipated Model X is finally over. Three years after Elon Musk’s electric car startup unveiled a prototype of the sleek crossover utility vehicle, thanks to an outpouring of braggy screenshots overnight from reservation holders, the finer details on what we can expect are out of the bag. Think fast, ludicrously fast. The all-electric CUV zips from zero to 60 in 3.2 seconds in “Ludicrous Speed” mode, an upgrade that will set drivers with the need for speed back an extra $10,000. (Standard mode is 3.8 seconds, zero to 60.) That’s on top of an already steep $132,000 starting price for the four-door Falcon Door stunner. As for maximum speed, the 90 kWh compact hatchback tops out at 155 miles per hour, with an estimated 240-mile range. Tesla confirmed yesterday that reservation holders can now choose not only how fast they want their luxury whip to go, but also their wheel size and paint color. Nine hues are available, including Deep Blue, Titanium and Signature red. The car’s flamboyant rear Falcon Doors are undoubtedly the all-wheel-drive vehicle’s most dramatic physical feature. The doors were named as such “because they look like a falcon in flight,” Musk recently told Forbes. He also told the outlet that the Tesla Model X is “meant to combine the practicality of a minivan, the style of an Audi Q7 and the performance of a sports car…” Goal achieved and then some. Additional standard features include a rear hitch for towing, heated side mirrors, built-in blind spot and parking sensors, heated power-folding side mirrors and automatic emergency braking. If you’ve been drooling over the Model X and have the resources to splurge for your own, good news, you can still reserve one. Call us when your order fulfills. We want to hear all about it or maybe just live vicariously through you.